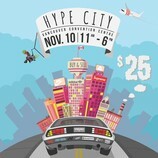 HypeCity is back again! Vancouvers Premier Streetwear & Sneaker event. We will have over 50 PREMIUM tables for you to buy/sell/trade from. A bunch of new features have been added with one of them being the HypeCity trading pit which is where you can see what heat your community has to offer!